Find instructions on how to order & distribute gift cards for paying human subjects participating in clinical trials and/or research studies. Vanilla Visa Gift Cards are pre-paid non-reloadable cards that may be used anywhere Visa is accepted, including retail stores and for online purchases. Integrated Procure-to-Pay Solutions’ Payment Services offers Vanilla Visa Gift Cards as a form of payment for human subjects participating in a clinical trial and/or research study. Vanilla Visa Gift Cards must be reconciled within 90 days of issuance. For more details, visit How to Reconcile Human Subject Visa Gift Card Purchases. Vanilla Visa Gift Cards cannot be cancelled or returned after issuance; therefore, departments are responsible for all inccurred charges, therefore we recommend only placing an order for the amount of cards you know will be disbursed. Vanilla Visa Gift Cards cannot be replaced if lost or stolen. Vanilla Visa Gift Cards are to be distributed to participants for the study/project identified at the time the initial order was charged. For participants receiving a total compensation of $600 or more in a calendar year, these amounts are subject to federal tax reporting requirements and will be reported on IRS form 1099-Misc. A W-9 should be submitted to IPPS’ Tax Advisory Services and the Human Subject Compensation Record form (PDF) should be completed. Tax reporting information does not link a participant to a particular trial, study, or research project. Refer to UCOP Policy regarding Payments Subject to Tax or Information Reporting. Obtain a current IRB approval letter and consent for the project/study. Create a new document in MyPayments using payment type: 'Clinical Trials/Research Study’ and sub-type ‘Human Subjects / Clinical Trials / Research Projects’. Select the Project Payment Type ‘Visa Gift Card’. Refer to MyPayments training videos for additional guidance. It is recommended to submit payment requests 2 weeks before anticipated payment date in order to allow time for appropriate routing for department approval and order fulfillment. For details on other Project Payment Types (Scrip, Payment to PI or Designee, Payment to Research Subject, or Payment to Vendor) refer to Payment to Human Subjects page. When your request is processed, the requestor will receive a communication from IPPS’ Payment Services indicating the order has been fulfilled and is ready for pickup. Gift cards are to be picked up at Torrey Pines Center South, suite 415 by the requestor or authorized receiver with a picture ID. For gift cards up to $1,000, secure in a lockable receptacle. For gift cards from $1,001 to $2,500, secure in a safe. For gift cards from $2,501 to $25,000, secure in a steel-door safe, with a door thickness no less than 1” and wall thickness no less than 0.5”. For gift cards from $25,001 to $250,000, secure in a class TL-15 composite safe or better. Vanilla Visa Gift Card charges will appear on the Operating Ledger on the same day that the card was fulfilled by IPPS’s Payment Services. Note: Gift Card fees will show as a separate transaction. 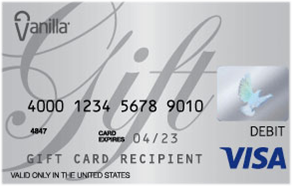 Once Vanilla Visa Gift Cards are loaded, they cannot be cancelled and are non-refundable. After gift cards have been picked up, the department index will incur the gift card fee even if the card is lost, stolen, or not received by the department. The values loaded onto the gift cards are dependent upon the amount requested. Gift cards are available in amounts ranging from $20 - $500. There is an initial loading fee of $1.15 per Visa Gift Card. See FAQ for additional information about Visa Gift Cards for paying human subjects.